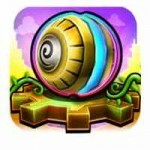 Game Dev Story will make the dream of countless gamers become reality on their iPhone: Being the head of their very own game development studio. You will be in charge of everything – from hiring people, to setting the scenario and taking care of the advertisement, everything will happen the way you want it to. Awesome. 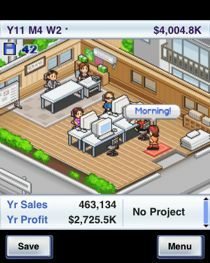 You start the game by choosing a name for your new start-up studio. That means you have very limited funds and literally no fans who support you yet. Of course we need to change this fact, so you will start hiring writers, graphic designers, sound engineers and programers to get down to business. And now the fun begins: You have to decide what game you want to develop. Do you want to develop an action-adventure in a pirate setting? Or what about a shooter in a sci-fi scenario? But that’s not all, you will also be able to exactly decide on what things you want to focus with the game. A limited amount of points are waiting to be spent on certain attributes like ‘Polish’, ‘Approachability’ or ‘Innovation’ just to name a few. The combination of all of these factors will decide how the critics are going to rate your game. And you will usually sell a lot more copies of well rated games of course. 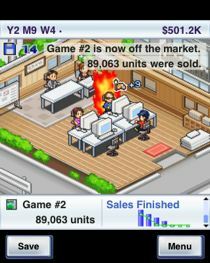 One more thing that influences your sales is the platform you chose to release the game on. As you progress in Game Dev Story, new consoles will be announced and old consoles will be taken off the market on a regular basis. But you can’t just go ahead and develop for a new console – you have to get a license first. The licenses are pretty expensive, so you want to choose carefully which platform is worth to have it in your portfolio. And since the next console generation is never too far away, you will also have to get new licenses to stay on top of the market. And don’t be surprised if the names of the consoles will sound kind of familiar. If you have followed the development of the gaming industry and the rise and fall of the consoles we have seen in the past decades, you will love the attention to detail that has gone into Game Dev Story. 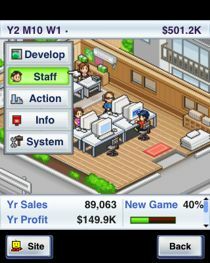 So as the years go by, you will keep on leveling up your staff, unlock new game scenarios and even move offices. 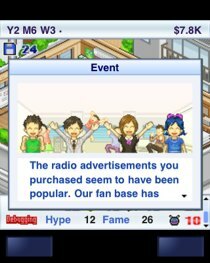 Thanks to demo distributions and other advertisement you arranged, you have built a solid fan base. And yet every time you release a new game it still feels exciting to see how it will be received by the critics and how good the game will sell. And what makes the game so great is the ease of controlling everything. 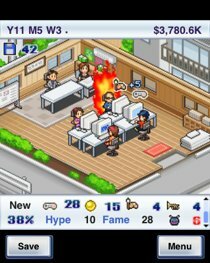 Of course this is no Civilization V that we are talking about, but the guys at Kairosoft managed to pack quite a bit of complexity into a very intuitive and simple menu system. Well done. The presentation of the game is simple yet charming. It comes in an 8-bit retro look complete with fitting sound effects. Don’t expect anything spectacular compared to what is possible on a current iPhone, iPod Touch or iPad. 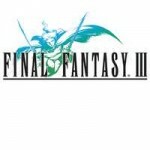 But rest assured I would never consider the graphics to be any drawback. Considering the era you start in Game Dev Story it fits just perfect. 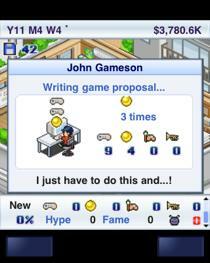 If you have ever dreamed of having your own development studio one day, don’t hesitate to buy Game Dev Story. It is currently on 50% sale for $1,99 on the App Store so be sure to grab it soon! However, even for $3,99 I can only recommend it. The time that most people I know have spent with it makes this price tag more than reasonable. If you want to give it a try first, there is also a lite version available.